Air fryers are much easier to clean than deep fryers that use lots of grease or oil. The cooking basket is closed to prevent spattering and any oil that is used goes into the oil pan to be discarded when dinner is over. With these units, air is the new oil! These cook up fish, chicken, and meat to crispy tender brown using a light batter, and are able to cook vegetables and fruit as well. Always read the instructions that came with your air fryer. If you don’t have it, you can find manuals online using the model number on the bottom or side of your unit. Different brands and models of air fryers have different instructions for cleaning and maintenance. Most of today’s air fryers have some parts that go into the dishwasher. But if not, try these methods. Don’t use knives, forks, or metal utensils to remove dried caked food from your air fryer. Most air fryers are coated inside with a non-stick product that’s easy to ruin. Never use an abrasive cleaner. Step 1. Wait until the air fryer cools to the touch and unplug it from the wall and the cooker, unless it is hard wired to the unit. Be sure all the old food is out of the interior pot. Never submerge the pot with plug electronics into water; it will be ruined forever. Step 2. Cleaning the air fryer is uncomplicated. Wash the cooking basket, tray, and pan in dishwashing detergent in hot water. Most of the newer fryer component parts can go into the dishwasher, but not the housing with the electrical port. Wipe down the housing inside and out with dishwashing detergent, rinse, and towel dry. Some parts are dishwasher safe, but check your User’s Guide. Some air fryers have magnetic cord attachments to the bottom and some cords plug into the unit. Step 3. If you have crusty hard food stuck to your air fryer, make a paste of baking soda and water and scrub gently with a sponge or cloth, rinse, and towel dry. You can use this paste gently on the heating element with an old soft toothbrush at the bottom of your air fryer. Step 4. Let all parts and the air fryer air dry for a few hours too before putting it away. 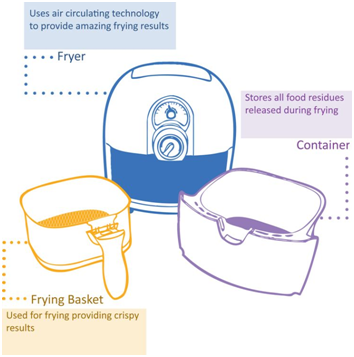 Tip: Clean the air fryer after each time it’s used; don’t wait until it’s a hard stuck-on mess before cleaning.